Simply stated, Fantastic Four is the best comic book movie of 2015. In a year that brought us very dull offerings from the Marvel/Disney cinematic universe, this little movie puts energy back into the over saturated superhero genre. While the story differs from it's comic book origins, it still works in the film — Reed Richards, a childhood genius, has been working on a teleportation device since he was a child. His genius is recognized during a high school science fair by the Baxter Foundation, where he is brought together with like-minded individuals to finish his work. As one can guess, things go awry at some point during the film, transforming these simple kids into super-powered beings who must come together to save the world from impending doom. Fantastic Four has had an uphill battle with a lot of negative press and controversy before the film has even hit theaters, and while some of my colleagues seem to be jumping on this bandwagon, the film really does pull through. Sophomore film director Josh Trank (Chronicle) takes a fresh approach to the comic book genre providing more of an "indie", dark feel to the film, a much needed break from the slick polished Marvel/Disney films as of late, and while his directing is a bit choppy at times, and not in the same league as someone like Bryan Singer (X-Men, Usual Suspects), it at least has it's own style. For the most part, the cast and their chemistry is spot on. Miles Teller (Divergent, Whiplash), who plays Reed Richards, gives us one of his best action genre performances to date, while the rest of the Fantastic Four, Sue Storm (Kate Mara; Iron Man 2, Transcendence), Johnny Storm (Michael B. Jordan; Chronicle, Creed), and Ben Grimm (Jamie Bell; King Kong, Jumper) complement each other very well. The only character that seems to be really out of place in the film is Toby Kebbell (Dawn of the Planet of the Apes, Wrath of the Titans ) as Victor Von Doom. Most of the time Kebbell is on screen he appears bored and half asleep. It's as if he took the film for a paycheck, and just really wasn't the best actor to play the iconic villain of the Fantastic Four universe. Fantastic Four is not without it's faults. One of the films major problems is that it suffers from being too short. Clocking in with a run-time of 100 minutes, the film feels very rushed at the end. Instead of providing a fully complete story it's as if Fox is just teasing us to get us to see the next Fantastic Four film, which is slated for 2017. The score, composed by Marco Beltrami (The Wolverine, Terminator 3: Rise of The Machines), is one of his worst yet.It does not fit the film at all. Instead of drawing you further into this alternate reality, it pulls you out of the movie, as if Beltrami composed it without even seeing the film itself. 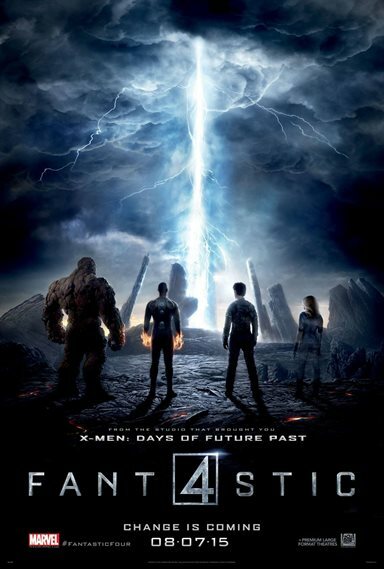 Download Fantastic Four from the iTunes Store in Digial HD. For more information about Fantastic Four visit the FlickDirect Movie Database.